Reginald Wellbye's book Picturesque Touring Areas in the British Isles was published in 1930, and while it may not be an entirely reliable guide today, the adverts in it are fascinating. 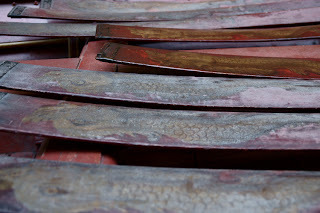 One attraction caught my eye; can you guess where it is? It offered 'unrivalled Gardens and Grounds' in 'The Fairyland of the British Isles' for just a shilling admission. For the active, there was 'Boating and Fishing on the Lakes'; while the hungry and thirsty were assured of 'Adequate Catering'! This 'fairyland' had been open to the public since 1924. Hugely popular at the time, it remains successful today although entrance is now rather more than a shilling. If you enjoyed Lassie, then Rescued by Rover is the silent film for you! The title does rather give away the plot, but there's plenty to enjoy even without a great element of surprise. I particularly liked the distraught father's insistence upon donning a top hat before rushing out of the house, and the happy ending for all concerned - including the 'villain'. Cecil Hepworth, director, was born in Beaufort Gardens, Lewisham. The son of a magic lanternist, he developed a film career and established studios in in Walton-on-Thames. While they churned out several films a week, this one was probably the first to include paid actors and was among Hepworth Studios' greatest successes. It even had to be re-shot twice as the original negatives wore out. Hepworth's wife Margaret both wrote it and starred as the mother, while Hepworth played the father. Even the baby was their daughter Barbara. After all, why pay half a guinea to an actor when you could appear yourself? As for the real star of the film, Blair the dog, he was the family pet! Obviously, I need no persuading on the value of local history; but I do love new ways of exploring it. One of the most creative is artist Amy Lord's The Takeaway Shop. In an hour-long session, participants make their own book before filling it with images and text about Deptford's history. 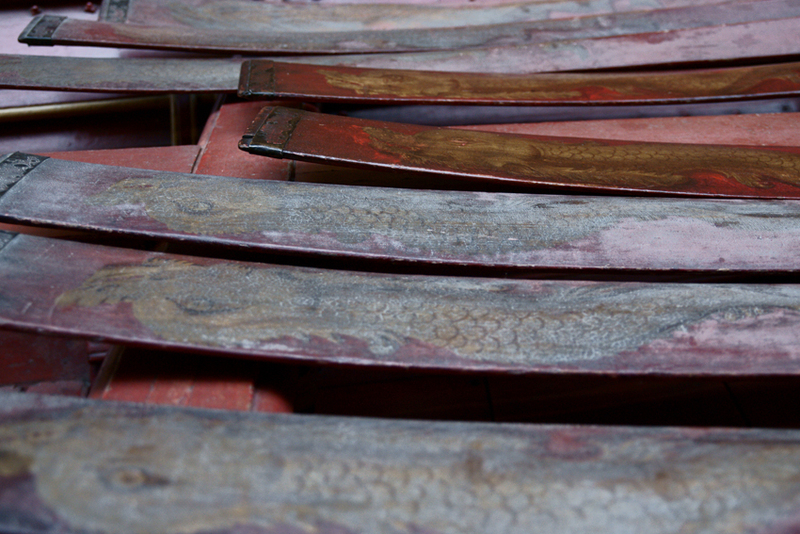 The mixture of craft and historical discovery is irresistible. 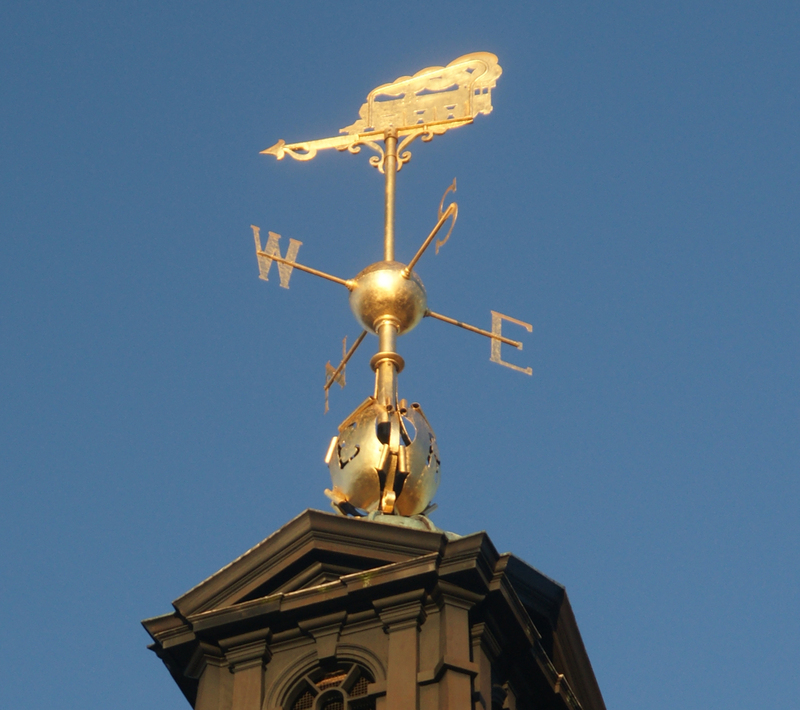 Lord has put together a wonderful selection of materials, from maps to images of buildings to photographs of events. That allows everyone to choose their own approach and create a unique personal archive to take away. It's also an opportunity to chat to other local people and share knowledge of Deptford's past. 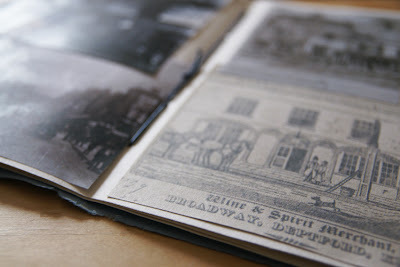 Along with the cutting, gluing and creating, I loved exploring new documents. Among my favourites was an advertisement from a job applicant in 1840. I've explored similar approaches to job-hunting by other Deptfordians, but this appeal for the job of gravedigger was new to me. The applicant didn't emphasise relevant skills (as an unemployed sugar-mould potter he presumably had none) but rather his personal misfortune: he and his eight children were left dependant upon his wife. His unemployment, he was careful to explain, was because wrought-iron moulds had rendered him redundant. What a wonderful combination of industrial, social and local history: a perfect illustration of the value of The Takeaway Shop. There's only one day of this event left, but if you want to book a last-minute place for Friday then click here. Transpontine has also visited. 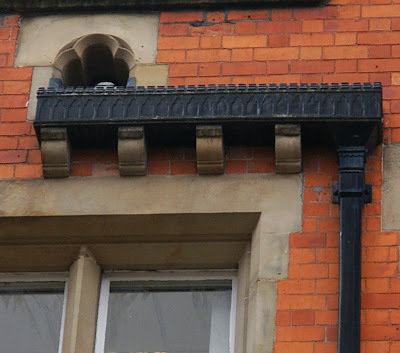 This is one of the most wonderful drainpipes and hoppers I've noticed. 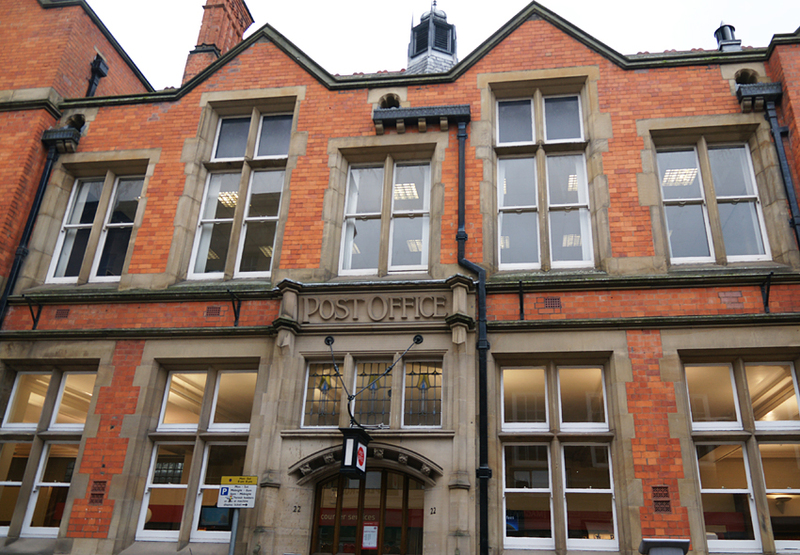 It's on the main post office in York, which is a rather nice Victorian building altogether. The building was designed by Sir Henry Tanner, probably the Post Office's best-known architect. 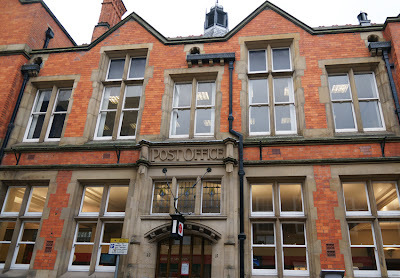 The year York Post Office was built, he became principal architect of HM Office of Works (the department responsible for designing most main post offices of the period). His post office work can be seen throughout the country, and included major London buildings such as the King Edward Building in St Martin's-le-Grand. Further reading: British Post Office Architects is full of information on both post offices and the people who built them. The British Postal Museum and Archive has published Built for Service: Post Office Architecture by Julian Osley. 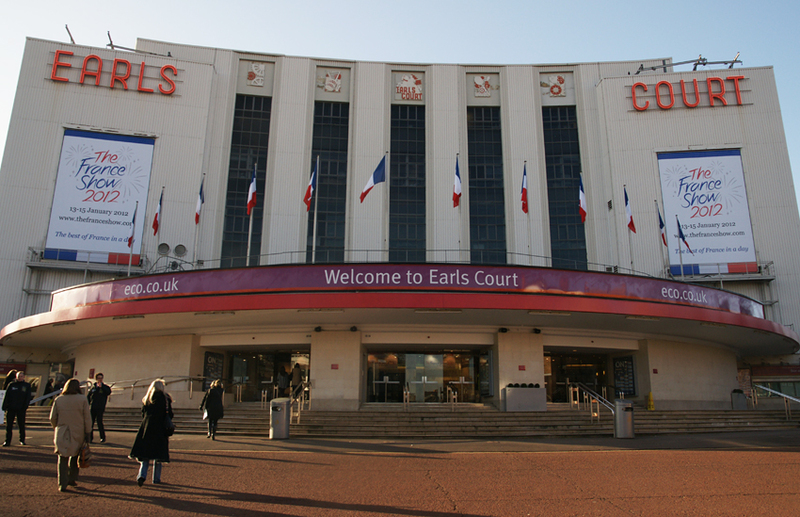 Built in just two years despite being located over railway lines, Earl's Court Exhibition Centre opened with the Chocolate and Confectionery Exhibition on 1 September 1937. In order for this building to be constructed, its engineers LG Mouchel & Partners had to work out how to build the foundations. Reinforced concrete beam work of great strength was the answer, raising the building over the tracks with columns and girders. One beam is 30 metres long, 5 metres wide and weighs over a thousand tons. That may sound excessive, but it's supporting a weight of over 4,000 tons! The architect was an American, C Howard Crane (working with Gordon Jeeves), who had specialised in cinemas. He left Detroit in 1930 to escape the Depression; among his other London buildings is the Gaumont (now Odeon), Holloway Road. If we look beyond the show posters and welcome banner, then the building is very much of its period with its sweeping curves, long, slender windows and at the very top, its reliefs. Most visitors probably don't look up that high, and frankly the details aren't easy to make out from ground level. Their subjects are presumably meant to reflect the events within: gears for industry, musical instruments, sports, and flowers for horticulture. 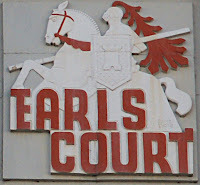 At the centre are the words Earl's Court below a knight on horseback. Just decipherable on the centrepiece is the sculptor's name: David Evans. 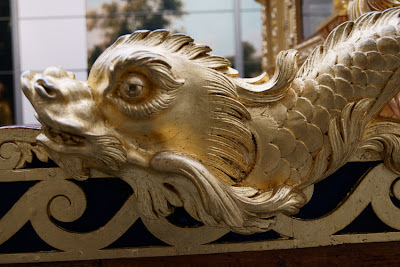 His better-known London work is the Guildhall's Gog and Magog of 1953. 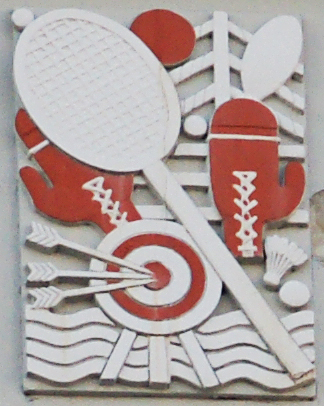 His Times obituary noted that 'it was in the illustrative relief that he excelled. His work was not conspicuously architectural in itself, but he had a very good understanding of architectural application, and he carried out several important schemes on public buildings'; these included Wandsworth Town Hall. Despite all this technical and artistic effort, the Exhibition Centre won't last long past its 75th anniversary. 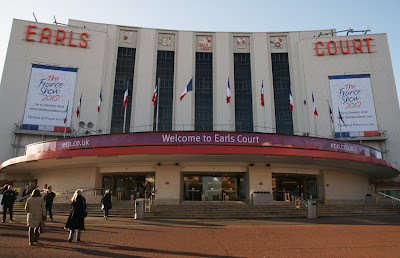 It is destined to be demolished after the Olympics (for which it will host the volleyball) and be replaced by a new development. This boundary post on Vesta Road, Telegraph Hill marks the historic border between Kent and Surrey. 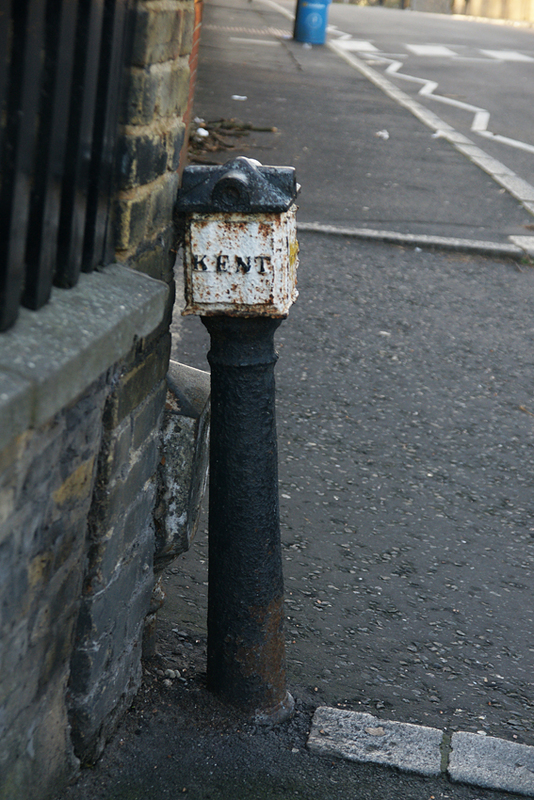 In the long years since county boundaries have been withdrawn, the post has developed a tired lean. Nonetheless, its message is still clear even if redundant. Look more closely, and there's a smaller, stumpier boundary marker at its foot. The shorter sign reads 'Haberdashers' Company' and marks the edge of the guild's estates. 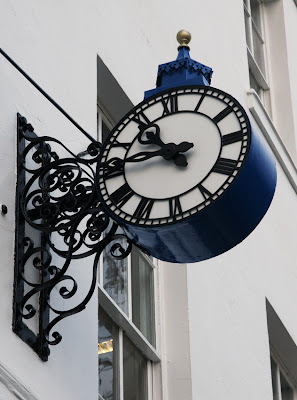 The City of London Livery Company developed the area in the late nineteenth century, building houses "of a superior class" from here down to New Cross Road. 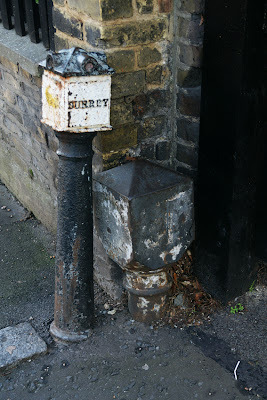 Their presence remains visible locally, not only in the form of bollards but also in the Haberdashers' Aske's Schools. Like London's, York's streets are well-supplied with clocks for the use of passers-by. Here are some favourites noticed on recent visits. 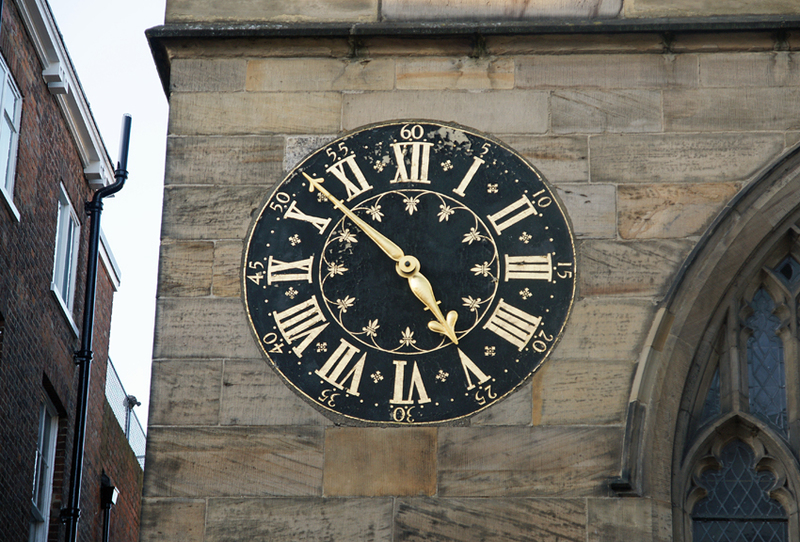 The street facade of St Martin Le Grand Church is dominated by a large clock, topped with the eighteenth-century Little Admiral (although they're currently away for restoration). The clock was replaced in 1855, and later heavily restored after being damaged in a wartime air raid, but the tiny seafarer and his sextant survived all this intact. Nobody knows if he represents any particular admiral, but he has been taking a sighting from the sun since the 1770s. 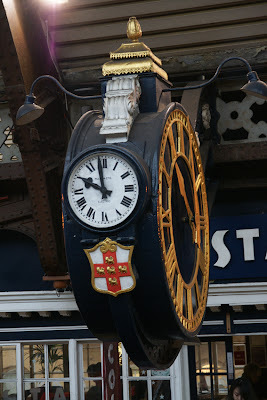 Given the importance of the railways to York, it's not surprising that a rather fine clock was erected in the station. It has been restored, and after some problems with an outbreak of spikes is now looking very handsome. I particularly like the small clock face on its side, ideally placed for those crossing the footbridge between platforms. 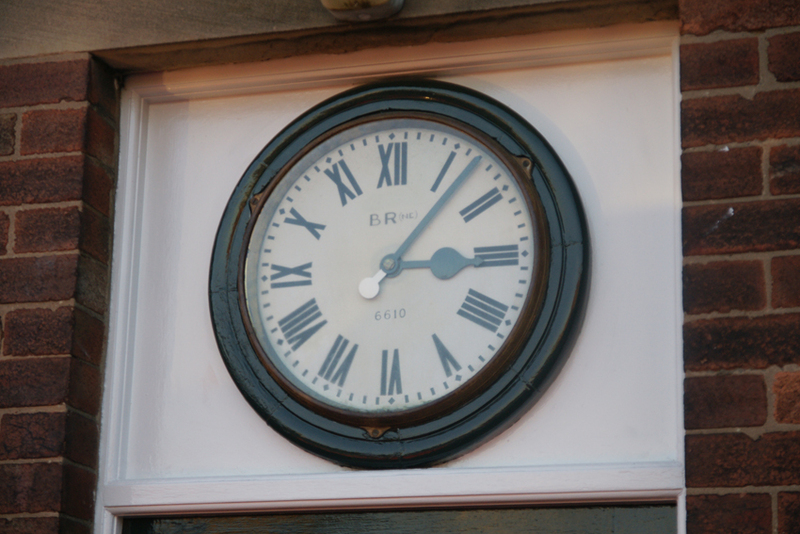 Much more modest is this British Rail clock, hanging above the doorway of a building now used as the National Rail Museum Friends' Office. 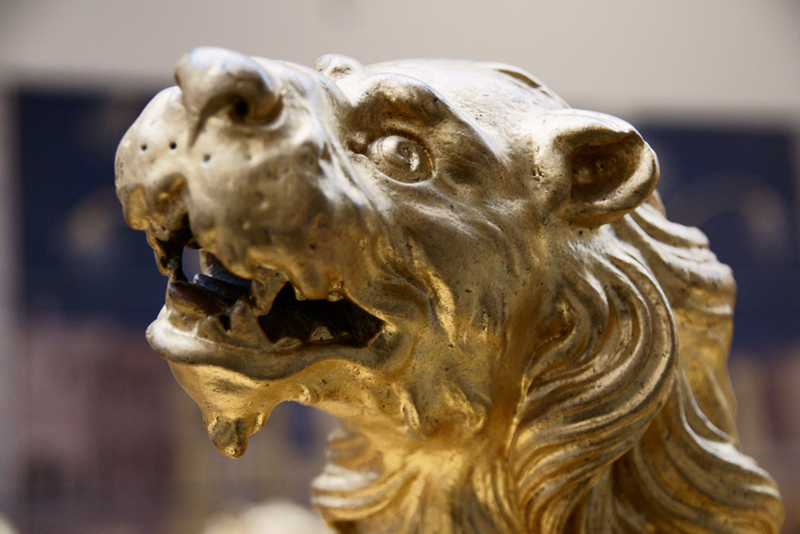 In the 1840s, an officers' mess was built for the Yorkshire Hussars. The De Grey Rooms went on to have various social uses, and are now occupied by York Theatre Royal. However, dances continue to be held in the ballroom; guests can check that they are fashionably late with a glance at this colourful clock. 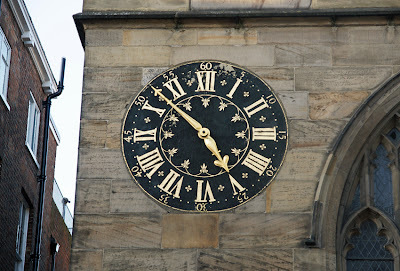 It was made by George Newey in 1906, as part of an exhibition for the British Association for the Advancement of Science conference, and afterwards hung in High Petergate before moving to its current location. 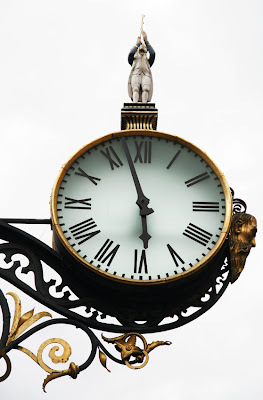 Newey's grandson Geoff still looks after the clock. He also cares for other notable clocks in the city, and restored the Little Admiral clock in the 1960s. 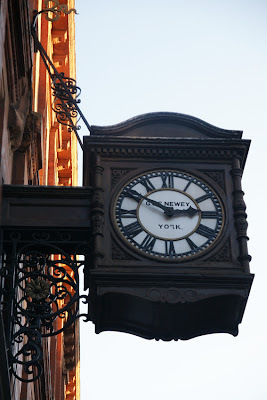 Here's another Newey clock, near the station. While the swirling brackets first catch the eye, the carved case holds the attention. 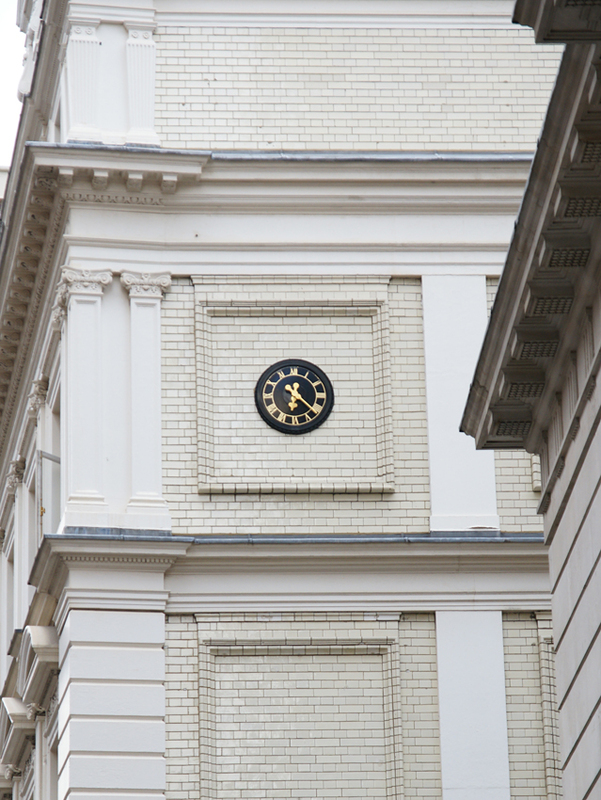 After the elaborate brackets and housing of so many clocks, this one is striking for its relatively modest profile. The face, with its gilt flourishes, is set directly into the wall of St Michael's, Spurriergate (now the Spurriergate Centre). Public clocks are a common, if treasured, sight in our cities but this example at Bell Yard always looks a little random and surprising to me. Although the bricks form a frame for it, the face appears to have been simply stuck onto the wall. The small alleyway off the Strand was once less than respectable: Sweeney Todd's conspirator Mrs Lovett had her mythical pie shop here. You won't get any mysterious meat pies today, however: Bell Yard is now a byway of legal London. Charity collecting boxes need to attract the attention of potential donors. Some do so by their location, placed strategically next to a till for example; others have novelty shapes and bright colours; while a few offer some small piece of entertainment in return for your coin. The latter tactic is far older than you might expect. 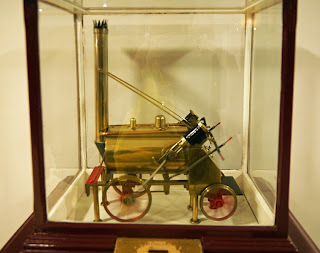 The Railway Servants' Orphanage in Derby placed models of Stephenson's Rocket on railway platforms in the 1880s. 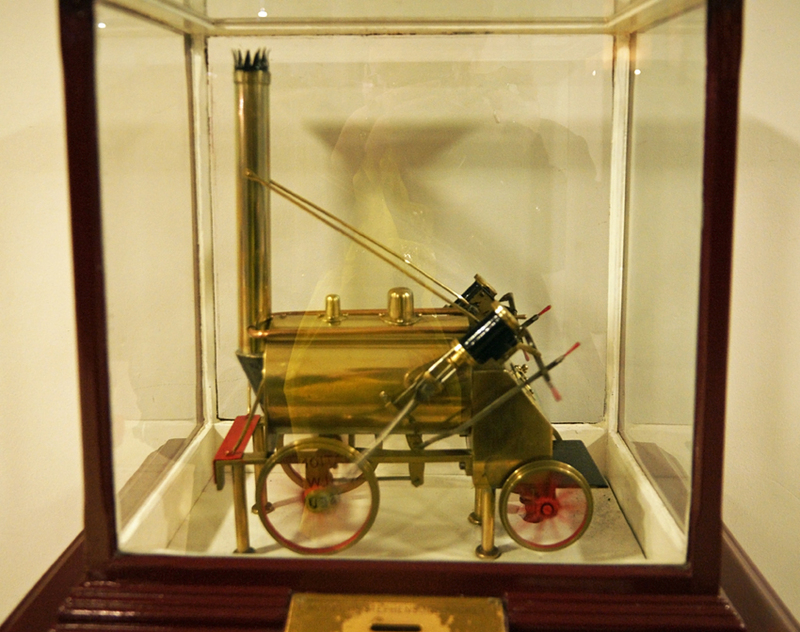 When a coin was inserted, the clockwork mechanism would spring into action and the engine would come to life. No doubt this was a very effective way of using 'pester power' to extract pennies from travel-worn parents! In 1930, you could have found one of these models at London St Pancras or Euston, or at 39 other locations throughout Britain. Although many were later converted to electricity, the example above still runs on clockwork. While its colleagues disappeared from their stations by the 1980s, this one continues its fundraising work, albeit at the National Railway Museum in York. 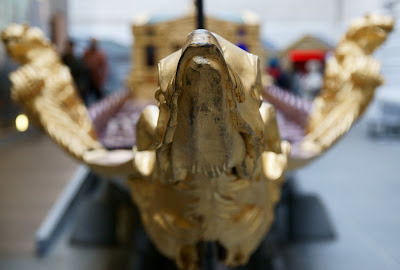 I've been away for a few days (hence the lack of recent posts) - but in which city? Bonus points if you can identify the building!